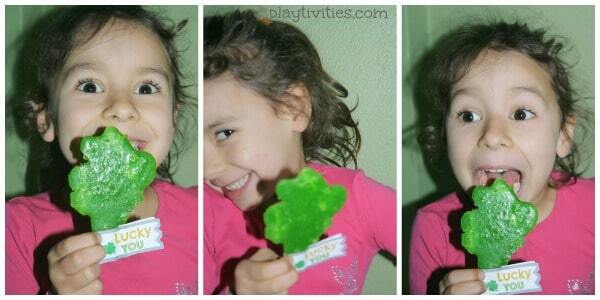 Irish or not, we made “St Patricks Day treats” today just to have get some extra luck and some … sugar of course. 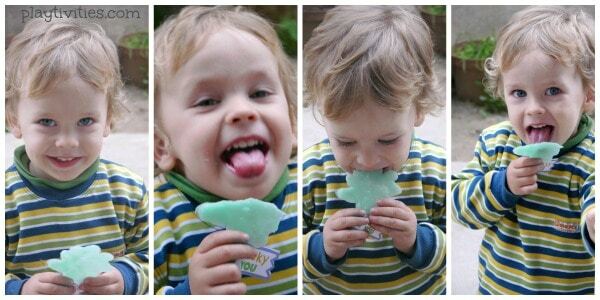 Usually, I am very careful about sweet stuff that I give to my children. But since this one is homemade AND doesn’t have the evil corn syrup I am totally fine. Well, as long as they have those treats at least 7 hours before sleep time. 1. 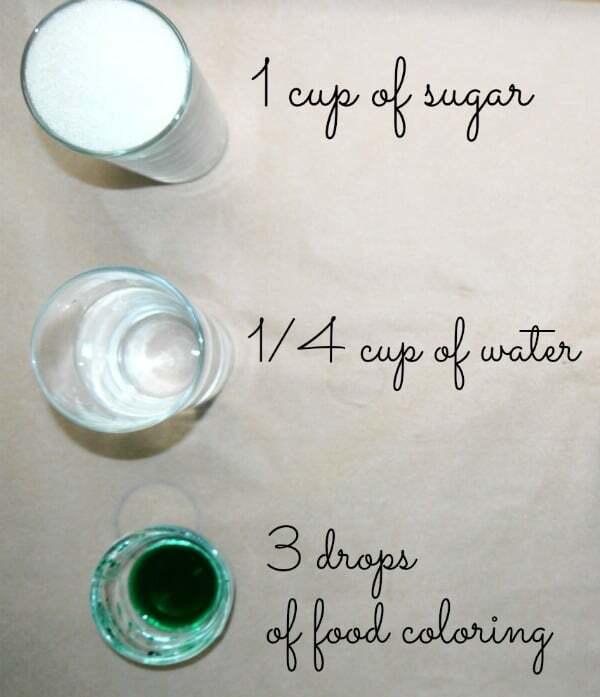 There is hot syrup involved in this recipe, so if you are working with children, please be extra extra extra careful. I did let my 5 year old participate in this candy cooking activity, but I was closely monitoring and only let her do things that were safe enough for her. 2. It’s crucial to work fast while making this candy, because sugar doesn’t wait for you. It will stay rock hard in your pan if you don’t have your things ready and start pouring the syrup right away after it reached the right temperature. 1. I got my parchment paper ready on the table. 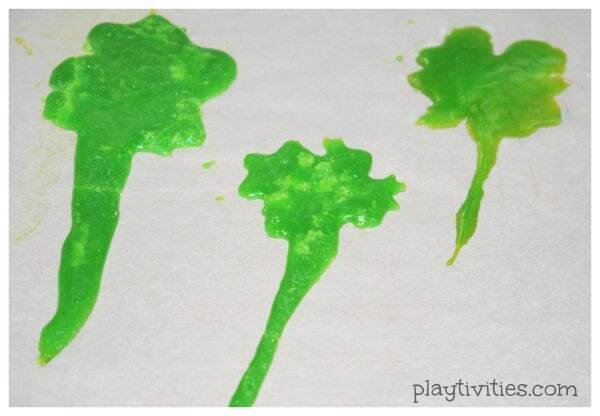 If you are using lollipop molders, make sure to oil them a little. 2. Pour all the ingredients in the pan, set the stove on high and start mixing. 3. Attach your Candy Thermometer, to the pan. 4. Make sure to remove crystals that form along edges of pan with wooden spoon. 5. Boil the syrup until Thermometer reaches 305 degrees F. 6. Carefully remove from the stove and place on safely on the towel (so it doesn’t slide). Make sure there is not child near by. Syrup is HOT and it can seriously BURN the skin. 7. Since my daughter begged me to be involved in this candy making I let her do the most important work. Shape the candy. I talked to her about being very careful and the danger of hot syrup. Using a wooden spoon she tried to wiggle the shape of shamrocks, which we actually drew on the parchment paper before to make it easier. Not bad at all for a 5 year old. What do you think? 8. 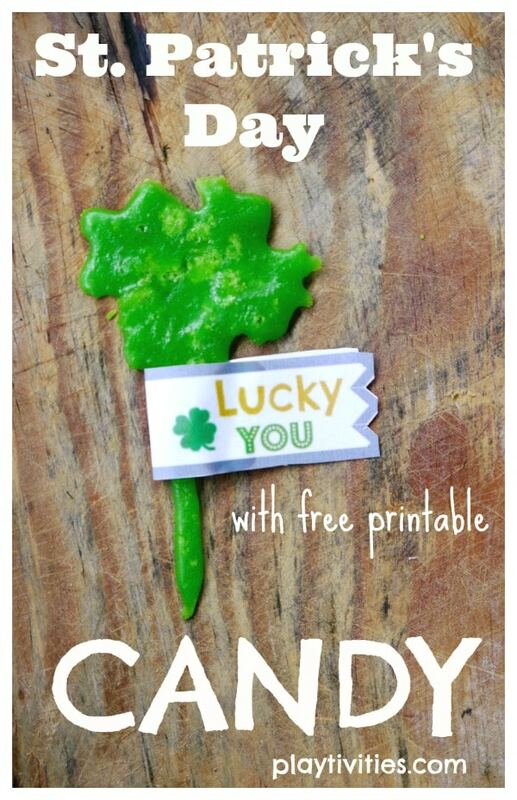 After the candy cooled down and hardened we attached the “Lucky You” tags I made. 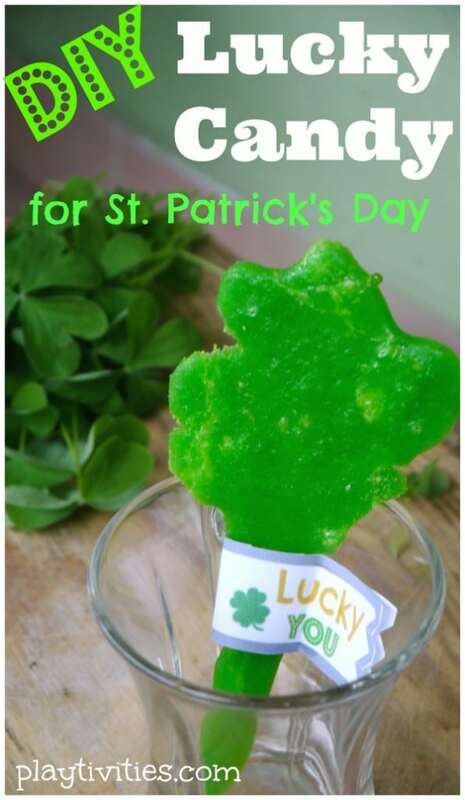 Grab a free St. Patricks Day treat printable and make a great party treat or a gift to someone who has a sweet sweet tooth on St. Patrick’s Day. You could always add colorful sprinkles to these candies. Unfortunately, we were out that day. But it didn’t make the candy worse. They loved it so much. Too much. Oh, boy, am I in trouble with all that sugar… and the energy coming out now. 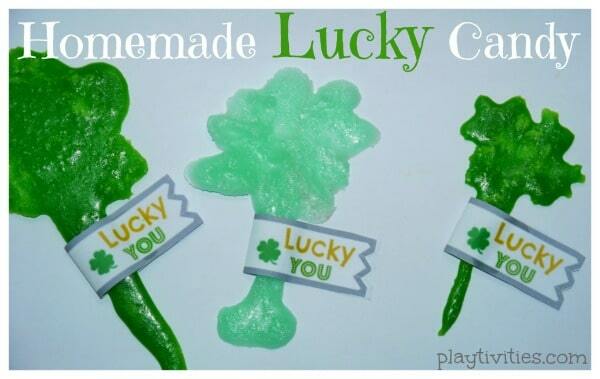 Oh, my kids will LOVE making these!